Now that I have an iPass account, and I got it working on my MacBook, next challenge was getting it going on the iPod, then I can listen to music and catch up on the news. Some times you get your credentials in the form of an email address and password so this forms the basis of what you do. After you've put in your credentials in iPass, save them. 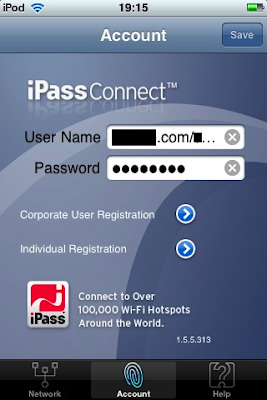 Go back to iPass, press 'Login' and after a few seconds you should be good to go. You'll know you're in if it says 'synchronising data'. 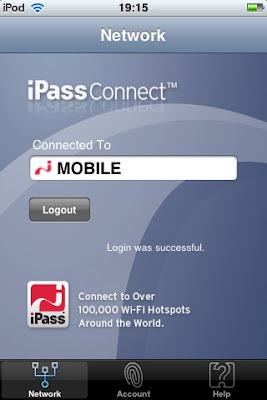 Thank you for this post as well--you are a great example of how to use iPass both on your laptop and smartphone device. We look forward to hearing more about how the iPass service works for you!